As this article is published, Frances Ruffelle is in Manhattan, back by popular demand to reprise her Beneath The Skirt cabaret at the discerning New York venue, 54 Below. It was only four months ago that her act was first seen in the city and to be invited back in such gloriously indecent haste speaks volumes for the singer's reputation. 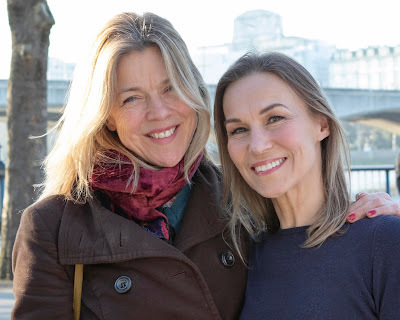 So I was delighted to learn that this popular and talented performer could find time amidst her busy schedule of pre-New York packing, for lunch and a chat about her work and family. Casually dressed in short cut dungarees and trainers, she breezed into a cafe high up on London's leafy Harrow On The Hill. Her home is much closer to the city centre, but Ruffelle was out in this suburb for a lesson in accordion playing. It is a tiny clue to this actress' devotion, that whilst she was not only refining her NY set, she was also planning her London cabaret Paris Original which opens on October 8 at the Crazy Coqs. Themed around her love for all things French and without giving any secrets away, it seems hardly surprising that she is throwing herself into learning this most quintessentially French of instruments, though if truth be told, she is not a complete stranger to the charm of the squeezebox. Her son taught himself to play and she laughs as she speaks of having frequently picked the instrument up to dance around the living room. With New York looming large, we talk about Broadway. Having created the role of Eponine with the RSC’s Les Miserables in London, it was to be only her and Colm Wilkinson (as Jean Valjean) who were asked to reprise their roles when the show opened in the USA, her invitation to cross the Atlantic coming as something of a surprise to the young actress who had already been told that she would not be crossing the pond. Whilst Ruffelle is rightly proud of her achievement in creating one of the 20th century’s most romantic stage characters she is also refreshingly modest in acknowledging the honour and the responsibility that came with breathing life into Eponine in both the West End and on Broadway. In her words, “everything is bigger in New York” and she speaks of having learned so much in having taken the role to the world’s two leading musical theatre cities. She clearly loves New York and feels very comfortable performing there amongst a city that she feels has always welcomed her. Ruffelle’s accordion teacher is Romano Viazanni with whom she has sung in the past, notably in the Leicester Curve production of Piaf where she played the title role. The production which ran some eight months ago was arguably one of the finest female stage performances to be seen in recent years, and whilst Leicester and Paul Kerryson are to be praised for having elicited such a marvellous production from Ruffelle and the show’s company, it is a modest regret that Piaf neither transferred south nor toured. 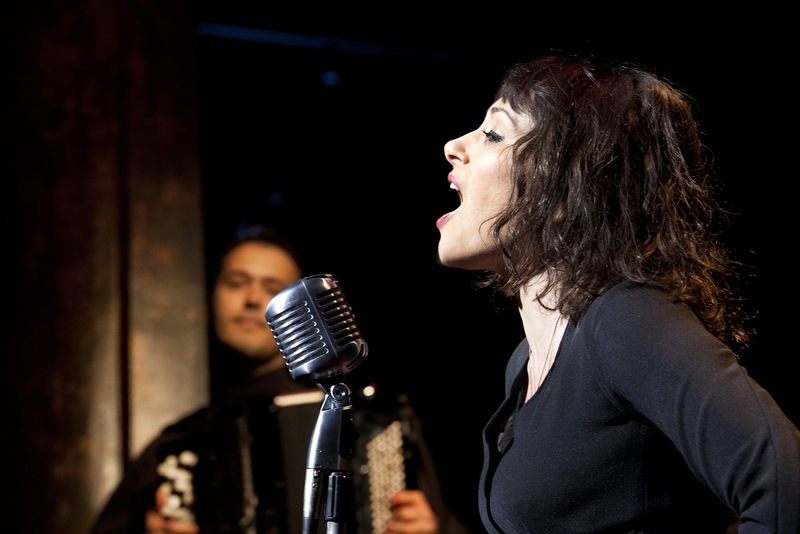 Should life ever be breathed back into that production, then Ruffelle’s Edith Piaf is a must-see. For a detailed look back, a review of Piaf can be found here, but to hear how Ruffelle prepared herself for such an all-consuming role is fascinating. Detaching herself from cast and crew she talks of how she kept herself apart in her hotel, mirroring the loneliness and solitude that was such a persistent feature of Piaf’s life. (Ruffelle is at pains to point out however, that where Piaf would take the elevator down to a hotel bar and hook up with a stranger, she was quite happy to exclude that particular experience from her preparations.) Her Piaf on the verge of death was a picture of a woman broken and Ruffelle’s dedication and immersion in the role left her genuinely in tears and destroyed at the end of each performance. The actress speaks warmly of how her own children, sons of 18 and 23 and daughter of 25 knew barely anything of Piaf before the Leicester show and how struck they were by the story that their mother was telling. Ruffelle also shares her sadness at Amy Winehouse’s tragic early death and how much she felt that Winehouse’s trajectory echoed Piaf’s brightly blazing arc, also a sublimely gifted performer yet so physically broken and taken so young. Interestingly and bringing the conversation directly back to her career, the actress comments on the real life harshness of Piaf’s childhood and youth, raised in a brothel and no stranger to life on the streets, with the bleak circumstances of Eponine’s (albeit fictional) adolescence on the streets of Paris. Both young women alone and desperately craving love. The Eponine / Piaf comparison is a valid parallel and leads our conversation almost seamlessly into her Paris Original act. One can imagine that Ruffelle almost has the red white and blue tri-colours running through her. She lives in London, loves New York, and simply adores anything culturally French. The food, the clothes, the shops, the Metro, she is clearly in awe of French style and speaks of how she as a child she adored playing French roles and how often she was mistaken for a native Francais. She adores the French composers and we reflect how whilst there have been very few French contributors to grand musical theatre aside from Boublil and Schonberg and also that French theatre itself is famed for little more than the Moulin Rouge, French culture has fuelled many an epic tale. The Phantom, Quasimodo, Beauty’s Beast and of course Hugo’s Les Miserables, have all provided fantastic canvasses from which to create duly fantastic musicals, whilst the truly legendary British musical fables of My Fair Lady, Oliver and possibly Mary Poppins all seem rather tame by comparison. I speculate that of the four French stories mentioned, three of them feature characters that are terribly disfigured. Perhaps this further defines a French charm, which is to recognise above all that real beauty lies deeper than just in stylish appearance. Ruffelle’s sets for both shows are not those standard selections of familiar stage songs that either have made her famous or else are typically popular favourites known to all. She is deliberately coy about her selections, both for New York and for London, other than to say that her choices are simply the songs that mean a lot to her and above all are those that she enjoys to sing. First and foremost though she recognises that she is an entertainer and strives to offer her audience their money’s worth in her acts. She loves what cabaret can offer and the intimacy that breaking down the “fourth wall” can achieve, but she is ruthless in considering other acts (that she refuses to name) whose choice of songs can appear as though they had been thrown together that very afternoon. Ruffelle spends months preparing her routines and cites as her inspirations, entertainers who are, or were, world class. Not surprisingly she reels off Midler, Minnelli, Sinatra and Presley as performers who have made her spine tingle. Another common thread to both of her cabaret gigs is producer and close friend Danielle Tarento. Famed for producing off West End productions to standards that are sector-leading in their consistent excellence, Tarento works well with the singer. The two women despise mediocrity and only recognise perfection in performance. Ruffelle speaks warmly of her relationship with Tarento that goes back many years to early TV acting together and refers to her friend’s contribution now being so much more than simply producing the events. She describes Tarento as akin to her “resident director” offering her notes after each night’s performance. Ruffelle is not just proud of her professional abilities, she is fiercely proud of her kids too. The work ethic seems to have permeated down to her brood as her two sons clutter up the house with the materials necessary to run their business that is manufacturing bespoke smartphone covers, whilst her daughter Eliza Doolittle is carving out a Top Ten career as one of the UK’s fastest rising singer-songwriter pop stars. Whilst Ruffelle acknowledges her daughter’s showbiz genes (Frances' mother is legendary stage school supremo Sylvia Young and Eliza’s dad is eminent theatre director and Les Mis co-director John Caird) she cannot emphasise enough how much her daughter’s success is not as a result of family connections, but rather the product of sheer guts and hard work. Even more than discussing her cabaret sets, when she speaks of her sons’ business achievements and Eliza having been writing songs for more than eleven years and having forged her own professional relationships with agent and manager, she beams with pride. “I’d like to say I taught her everything she knows” she jokingly enthuses, but well aware of how tough “the Business” is away from the spotlight, Ruffelle sees in Eliza an assured young woman who is as grounded and prepared as could be in managing the fame that she has earned. I suspect that the relationship between this dynamic mother and celebrity daughter could not be closer and Ruffelle projects the image of a mother who knows that there are few things more important than a caring and responsible love between parent and (even adult) child. To define Frances Ruffelle as a workaholic is quite possibly to understate the scale of the autumnal challenges currently on the actress’ radar. Returning from New York at the end of this week, picking up at the Crazy Coqs two weeks later, in between these two residencies, this whirlwind of a performer will be workshopping the new musical interpretation of Gurinder Chadha’s 2002 britflick, Bend It Like Beckham. With music and lyrics by Howard Goodall and Charles Hart respectively and with Chadha returning to direct, the workshop’s credentials are impeccable. It’s a hectic time and Ruffelle sees her preparation for the workshop as simply just another professional obligation that deserves the very best of her abilities. It’s a gloriously sunny day amongst Harrow’s ancient beauty as Ruffelle, in a casually chic style that could almost suggest Jane Birkin, wanders off to her accordion lesson. An actress and mother, proud of herself and of her family and a truly impressive woman.